In 1889 Joseph Pedegana, son of Peter and Mary Pedegana, was born in this house. At that time it was long and thin with a wide front porch and a lean-to kitchen. The house changed owners in 1903 when the Babik family purchased it and remodeled it further, adding more bedrooms and a shake siding over the original clapboard. Susie Babik was born here and the house remained in the Babik family until the late 1950’s. It was moved to Gilman Village in 1977. 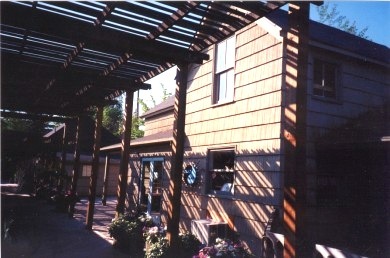 Back side of the Pedegana House. July 1999 Photo by David Bangs.